I can’t believe the Fall semester just flew by the way it did – and spring is already here! Well no spring temperatures in sight in Minnesota at this time. Between dissertating, job applications, conferencing, and serving on various committees, I can’t say that I was bored not teaching last year. But now I am really excited to be back in front of the class room. This semester holds a special treat – I get to teach a large lecture Feminist Film Studies class in the Gender, Women, and Sexuality Studies Department at the University of Minnesota. GWSS 3307 Feminist Film Studies is an upper-level film analysis and theory course which surveys multiple approaches to feminist film theory (including, for example, semiotics, psychoanalysis, critical race theory, queer theory, and ethnic studies) to examine movies: from Hollywood Classics to contemporary “blockbusters,” independent films, documentaries, and web series. Over the Spring semester, students will watch Vertigo (1958), Legally Blonde (2001), Fire (1996), Zero Dark Thirty (2013), Fifty Shades of Grey (2015) and Tangerine (2015) among other movies. While the course takes constructions of gender as a central analytic and seeks to problematize conventional notions of femininity and masculinity, we are also considering issues of sexuality, race, class, ability, nationality, and film aesthetics. As a media scholar I’m especially interested in integrating multi-modal writing assignments and digital technologies into the class room that foster students’ media literacy, prepares them for various future careers, and shares our knowledge with a wider public. For the Film Studies class I, therefore, decided to design a WordPress course blog for our class where students write blog posts and engage with each other throughout the semester – here is access to GWSS 3307 Feminist Film Studies. Assignments include blogs about the oppositional gaze, a review of a movie they watched in theater, as well as the application of media examples. Students get to tinker with the technology and learn how to effectively integrate audio-visual materials into their writing. Another important component of the class integrates students live-tweeting about the movies we watch. 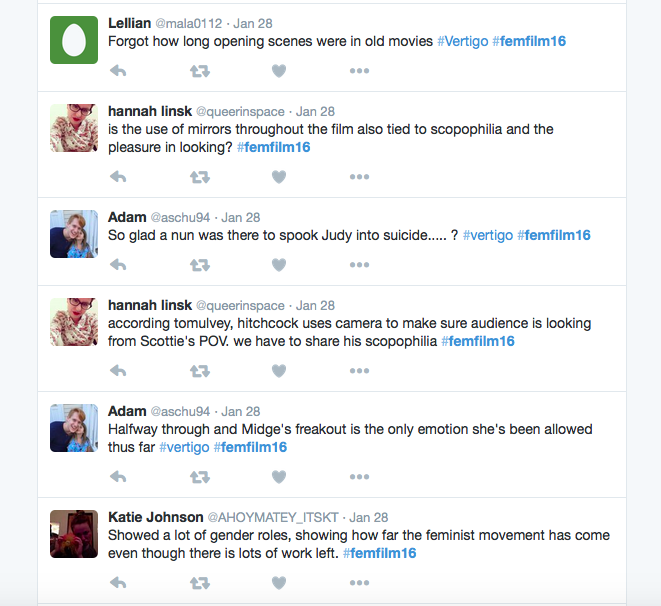 All tweets are archived under the hashtag #femfilm16 . 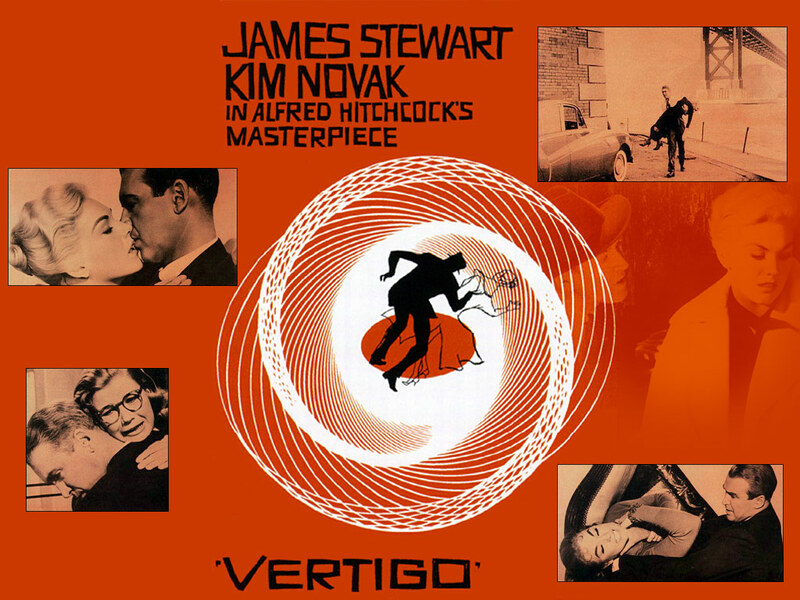 I’ve assembled tweets and commentary on the first film we screened, Vertigo, in this great Storify – check it out! Finally, students will be producing their own feminist video essay as a final project: they are asked to identify a narrative, representation, cultural ideology, political economy issue, or industry convention permeating popular media that they want to critique. Drawing on the concepts and theories we’ve engaged throughout the semester, students will be asked to create an alternative view-point about their chosen media object/text(s) and issue a call to action. They will produce a 5-7 minute video in whatever format they see fit – whether it’s a vlog, remix, fan-vid, parody, music video, voice-over commentary, or public service announcement. I’m excited to see what creativity this project sparks and I look forward to share some of their final products with you in May!